As the first glint of light breaks across the dark sky, I double-check that all my camera gear is packed and ready. I’m up in the front, seated next to our pilot, Rob, as the helicopter’s engine roars into life. For me, making the most of the Kimberley’s rugged wilderness on camera is all about capturing the light. Along with three of my fellow True North guests, we are heading to Raft Point to watch the sun rise over the landscape. The colours change in seconds. 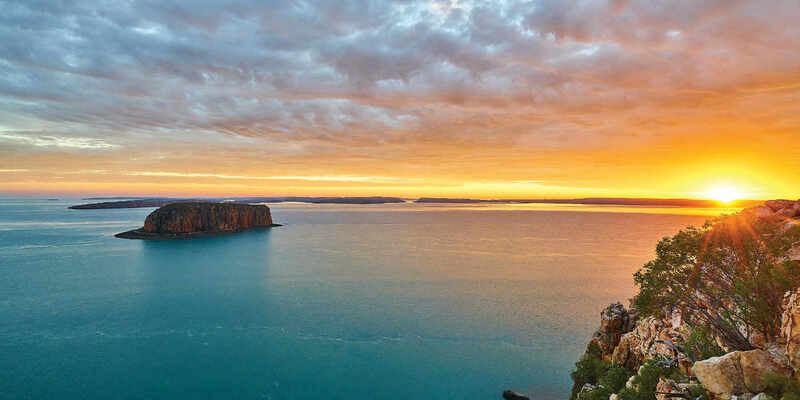 With cameras set on tripods, we watch as a low cloud catches the sun, casting its rays in a spectacular kaleidoscope of colour across the sky, and landing on the sandstone cliffs in brilliant shades of orange and deep maroon. This is the beginning of our two-week, thousand-kilometre ‘Kimberley Ultimate’ adventure through the remote coastal beauty of Western Australia’s Kimberley region. Our time on board the purpose-built True North is full of adventure, from waterfall swims and helicopter rides to fishing expeditions. The four boys, aged between eight and 14 years, who are along for the ride quickly forget that their electronic devices have been left at home. True North’s shallow draught means we can access rivers, waterfalls and reefs more readily than larger ships operating in the region. The all-Australian crew delivers a warm, friendly service that makes us feel like we’re on board our own private yacht. 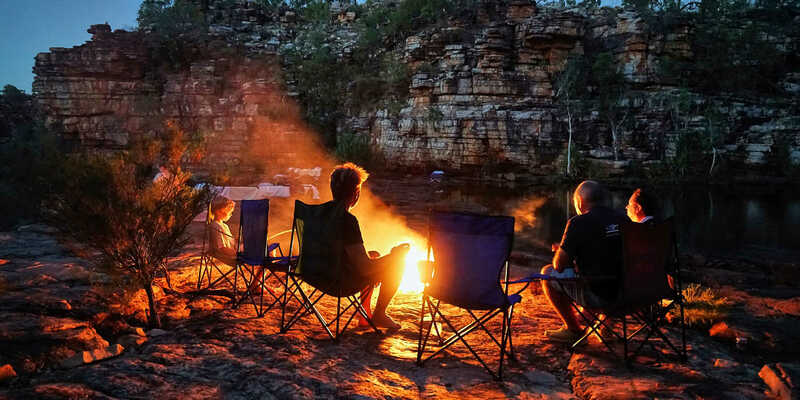 With its ‘magic carpet’ – a resident EC130 helicopter – guests visit remote Indigenous rock-art sites, fishing holes and picnic locations that would otherwise be almost inaccessible (unless you were keen on a four-day hike). On board, we are treated to all the amenities expected of a five-star hotel, paired with a fresh, daily-changing menu and premium wines. One of the highlights of the adventure is the crew’s 02 dedication to experiencing the Western Australian sunset at its best each day; perhaps a pop-up bar on a deserted beach with deck chairs ready, a bonfire raging and the kids starting a game of beach footie with some of the crew. With tides swelling to more than five metres, the water rushes from the submerged Montgomery Reef with huge force, giving the guests on board a thrill, as if we were riding rapids. Boarding the helicopter, we hear that humpback whales have been spotted in the channel – early for the season – and, on our way to get a closer look, we see a submarine field of rays and sharks amid a kaleidoscope of reef colours. The adventure peaks with the sight of a dugong swimming below the surface. As we swing around for one last look, it comes up for a breath, almost looking up at me as I capture the last few frames on my camera’s memory card. The Kimberley beaches are pristine, marked only by the occasional imprint of a crocodile belly leaving its trace, a reminder not to get too close to the salt water. 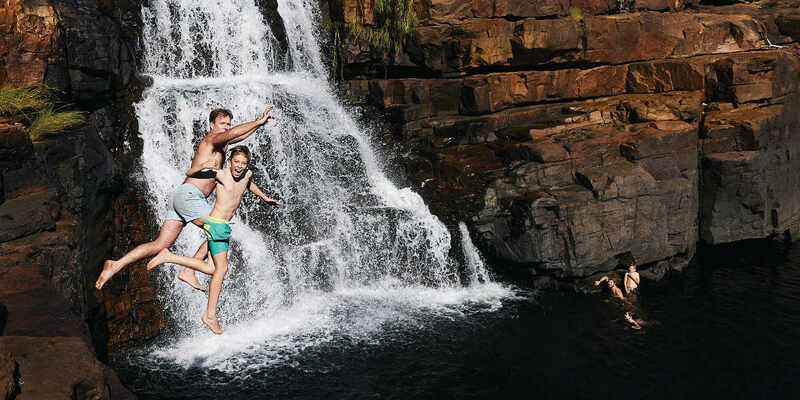 The freshwater pools and waterfalls are a haven for our boys on hot days. The clear, cool water is a welcome reprieve from the rugged terrain we’ve crossed to reach these magnificent locations. This is also a time to reflect on our nation’s first people as we walk on their land, learning about their culture and marvelling at the rock art they created over millennia. I’ve set the alarm early again so I can be on deck for the first light over the Hunter River. The river is rumoured to have the largest concentration of crocodiles in Kimberley, and we are excited to witness the magic first-hand. True North photographer Oli shares his insights on how to best capture the river’s morning sky. He sets up a time-lapse camera and as we watch the pink sky deepen, the water surface breaks to reveal the parallel glints of crocodiles’ eyes as they move slowly around the bow of the boat. The Eagle Falls are so remote that they are only accessible by a three-day hike or via a thrilling 30-minute helicopter flight from True North. All 36 guests on board fly to the falls for a picnic day. One night, we decide to stay back and camp as a family, along with the pilot. We cook dinner over an open fire as the sun sets behind the ranges. With instruction from Oli, I try out some new photography techniques to capture the night sky. It feels as though I am in a dome filled with stars. A voyage on True North is best suited to those with a sense of adventure. Every day, we are exposed to new experiences and rich local history that give our family a renewed appreciation for the beauty of our home country. After our two weeks on board True North, I would rank the Kimberley firmly on par with Antarctica, and my new favourite place to capture the light.